Archery has been a favourite of mine for as long as I have been strong enough to pull back one of those kids' bows you see in sporting sections of your big box stores. I learned on a longbow, and have shot one ever since. Something about the mechanical advantage in compound bows steals the appeal from me, and even the occasional recurve sets me astray. Bowyering, or the art of crafting bows, is something that I always wanted to try my hand at, and it finally came time to get down to it. Having little to no idea what I was doing, I have since made two more building on what I learned from the first one, and I might try to make a composite of some kind in the future. 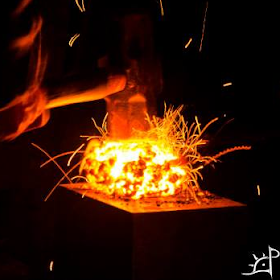 As simple as it is, there is something mystifying about turning a piece of wood into such a powerful tool. As with all good things, this began with a trip to the hardware store. 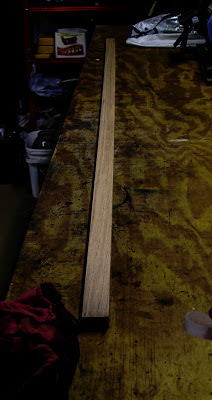 Initially, I intended to make the bow from hickory, but after sorting through the ten or so 1x2x6 and as many 1x2x8 boards, none of them were satisfactory. All of them were either cut the wrong way so the rings would lift and it would rip itself apart when drawn, or the grain was the farthest thing from straight. Unfortunately, most wood of that size is meant to be seen, which means it is more appealing with interesting grain patterns and knots. Both of those things are less than optimal for bows, although it can be done. Instead of the hickory, I sided with red oak. This one is the best I could find, and while not perfect, it will do. The cut of the wood leaves the grain running off the sides, and it is a little warped. This 6' board cost about $4 after tax and came pre cut and plastic wrapped by the manufacturer. Other retailers sometimes sell it by the foot, and is typically more expensive, sometimes as much as $2.50/foot. To accommodate the warpage, I marked the geometric centre of the board by measuring three feet (on a six foot board) from either end and drew a line there. Similarly, I marked the centre of the width with a ruler, which was about .75" (on the 1x2). With width markings on either end as well, I drew a centreline with a drywall chalk line clamped on one end. To pass through the centre, I used the one fixed end as an anchor and passed the taught string through the mark and pulled down on the other end. While it does not pass through the middle of the second end, that will be taken care of while cutting the limbs. That second board in the picture is along for the ride, although I'm not working on it. It is also red oak, but pre-finished with stain. The picture above shows a close up of the handle markings, with the X in the centre being well, the centre. The other lines there are 3" out from the centre, and that will be the area I leave in tact for the handle. Later on, there will be another set 5" out that I used for fading the limbs into the handle. 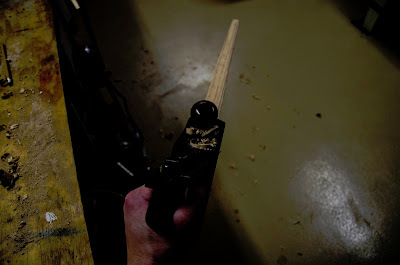 Some folks at this stage will glue another piece of wood on over where the handle will be to make it both able to be reduced width wise so it is more comfortable to hold and also reduce the flex through it. I also marked that side with the chalk line on it as the back, so I work only on that side. 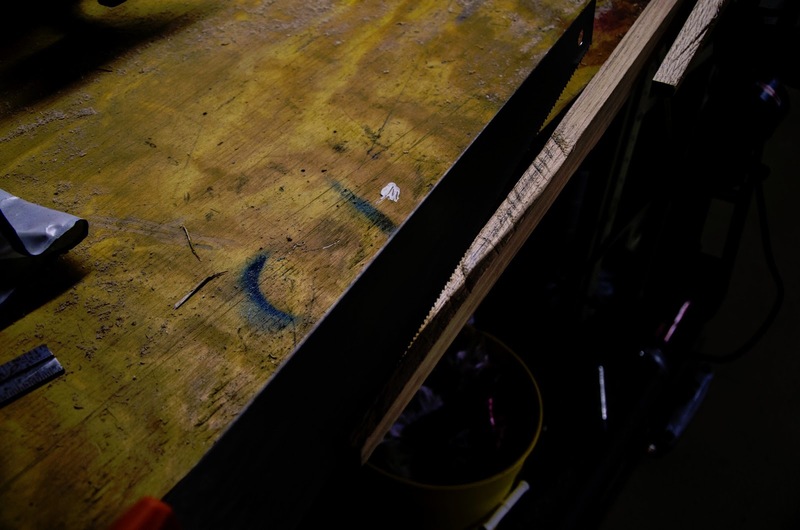 By leaving the front factory finished, it will not need to be touched until the backing goes on and also reduces the chance of introducing cracks and splinters to the surface in an effort to make it plane. Next I marked the rough outline of the limb shape. 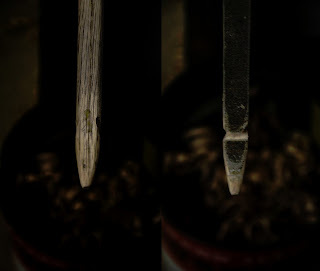 Physics says that a member of constant width and thickness will bend most at the centre when subject to loads at the ends with a brace in the middle, so by reducing the width and thickness of the limbs gradually as they move away from the centre, it will make a smooth arc instead of a V.
The rough shape here leaves the board at half an inch wide at the tip, tapering to the full width over 18". The combination of the shape and tiller can allow the length of that taper to move closer and farther away, but I liked how this looked so it was relatively arbitrary, bearing in mind that the dimensions will change once I smooth things out and begin tillering. For this bow, as I mentioned earlier, I had no idea what I was doing, so I used a hand saw to cut the limbs to shape. While in theory there is nothing wrong with this, I found it immensely easier to use a hand plane (shown later) to do everything. The saw left jagged marks that took considerable effort to remove at the expense of final draw weight, regardless of how careful I was. Besides, with the saw, once you make the first cut, you have committed to the shape. With the plane, it is gradual and more difficult (relatively) to botch. Here's what she looked like after cutting one end. Note the jagged splinters and ugliness of the once straight line. This was all taken care of with the plane, but remembering what it looked like here makes me amazed that it turned out as well as it did. Same thing to the other side, and it started looking somewhat bowlike. At this point, I was about four hours in, not including the time at the hardware store wandering around looking for wood. Now instead of cutting down the sides, I cut the thickness. It goes from 1/4" or 3/8" to full thickness over 25" or so. This is the time where it is important not to cut the wrong side. Or, the time to decide which side you want to be the front and back. This board had a little bend to it so the outside of the curve became the outside of the bow (a little natural set, if you will). This is the stage where I really regret not using the plane to to the work. Cutting thin pieces across a long section is unpleasant at best, and at worst leaves the cut twisted. Because of the way I was cutting, the blade cut at an angle and left the top side wider than the bottom. With the plane, this is more difficult (again relatively) to do, since it is lying clamped to something. There's the plane. Old as it is, it still does wonders. This was the beginning of the rough tillering. Tillering is, essentially, making the two limbs bend equally and smoothly. By shaving down one, it weakens it, removes flat spots or hinges. Here is a shot of what it looked like after a few passes with the plane. Notice how much smoother it is and the beginning of a slight crown to the belly. Removing the scratches and tooling marks helps prevent it from splitting and cracking and doing otherwise self destructive things that would cause you bodily harm when shooting it. In the second two I later made, I planed the whole thing, clamping it to the workbench and taking slow passes until it was straight and symmetric. Others use rasps and scrapers, which are nice but not as fast. Later, I'll use a file to smooth the edges and take out the lines and slight corners left by the plane. This is what the stave looked like after planing down both limbs and the belly after cutting with the saw. And now for the fun part. Or, if you are not into that sort of thin, the tedious and meticulous part. Tillering. Tillering is making the limbs even and removing the flat spots and hinges. In lieu of having a proper tillering tree, in which the bow sits atop a board and is pulled down to a certain length, adjusted, then pulled farther, and adjusted, until it is at its full draw length, I used this. I took, in all my glorious preparations for this, the only bit of 2x4 longer than a foot that I had on hand. It is a little shorter than the 30" I made this bow to draw, but as with everything else, I improvised. I cut a slit in the middle on the top for the string to sit in, the other end placed on the bow's handle. 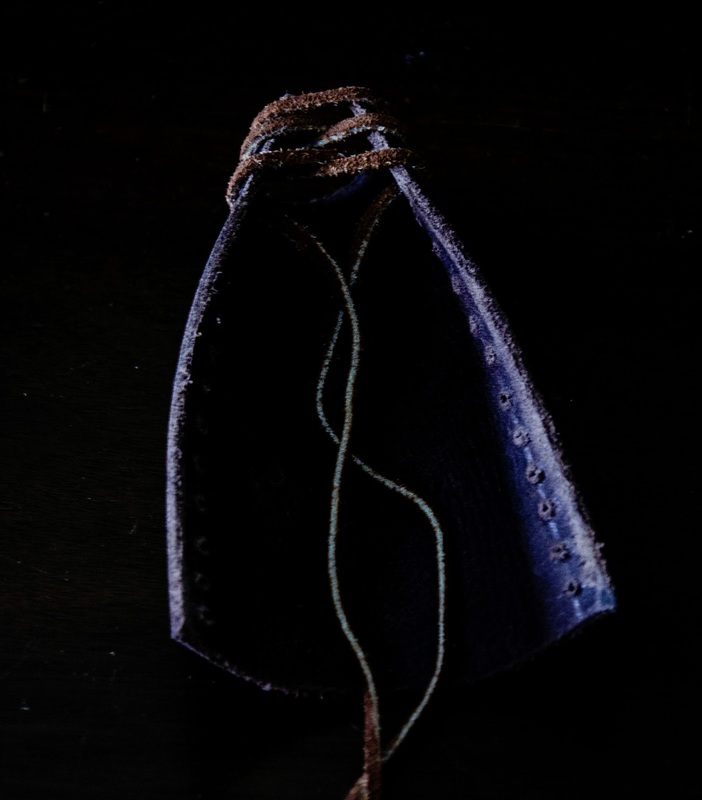 With the string, there is a slipknot in one end and another somewhere along the way towards the other. I tied it so it was about a foot longer than bow itself, so there would be minimum bending when the board was wedged into place. This is as far as I was willing to bend the bow without backing it. 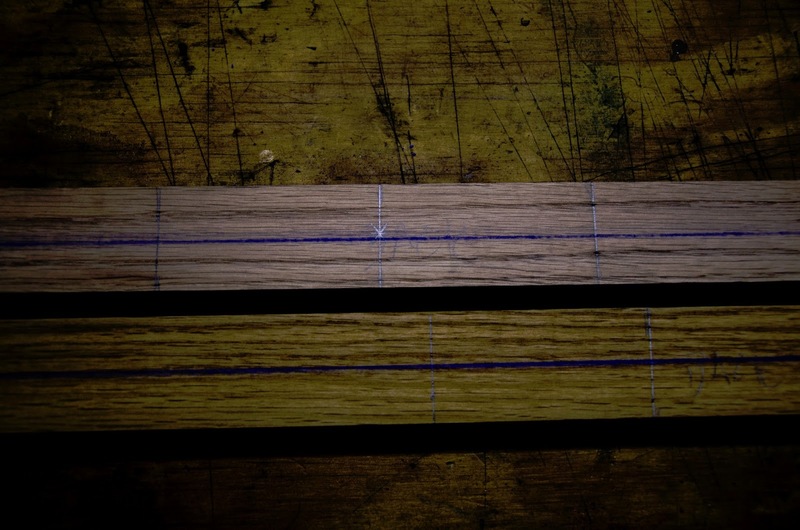 While bows do not inherently need backing, it is a good idea when working a stave that is less than perfect. 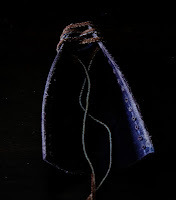 Backing helps prevent the grain irregularities- the knots and burls and inclusions and scars and grain running off the edges- from lifting up and splitting the bow drawn. Intuitively, tension on the outside causes it to pull itself apart, although the compression in the belly does not. 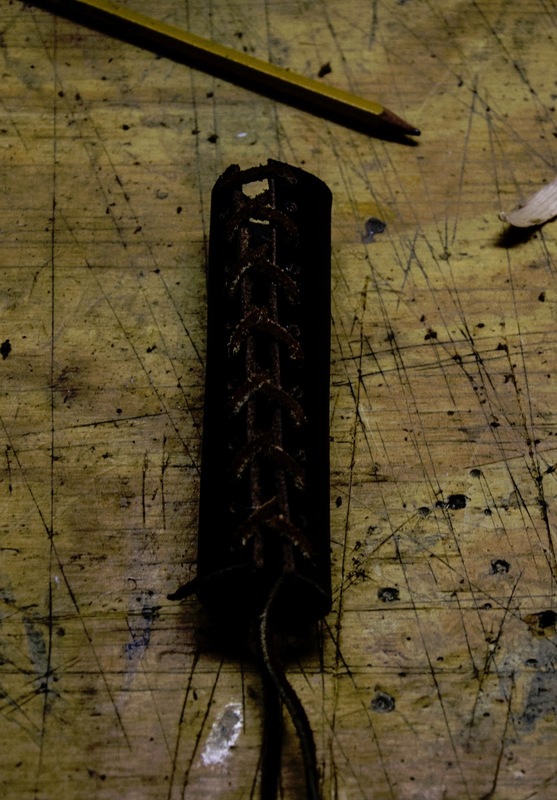 Backing can be anything really, from other woods like bamboo or hickory to silk and fibreglass and horn. I decided to use a combination of sheetrock tape, for the bottom two layers, and a coarse linen for the top. The reason for this is sheetrock tape is cheap, easy to find, good for the job, and easy to work with. The linen is to make it less ugly. The first layer went on over glue. I used Titebond II woodglue from the hardware store. At this stage, it was important to cover the entire front of the bow (the side that faces out when you shoot it) with the glue. Air bubbles and thin spots defeat the purpose of backing it. Over that went the sheetrock tape, pressed down and smoothed over with a finger until it was submerged. Let that sit for half an hour, and then put down another layer of glue, and another layer of the tape. Another half hour later, and on went the linen, same as the others. This took a little more care, as the fabric is porous and likes to grab the less-than-cured glue over the sheetrock tape and wreak havoc. It doesn't matter if the edges are clean, as long as it covers the entire face. After it dries, it will be cleaned up. This is it when the fabric went down. Note the glue saturating through to the surface. This is good, because it means there will be a better bond than between just the surface and the layer below it. The only thing is, I had to make sure the whole thing looked like the parts in the centre, which meant I had to add more glue and press down. Watch out for it lifting back up, as the top is now sticky and looking for something to grab. And trimmed. A classic box cutter to cut off the flange, but it does not have to be all that close as long as the non glue saturated bits are gone. This is after 24 hours, the glue given its time to cure fully. It's really not that exciting to watch dry, and checking on it every five minutes only proves that it does take more time to cure. Resist the temptation to touch it while it dries, as it will lift up. Since the backing covered the knocks I cut in earlier, it was back to the round file to clean it up. 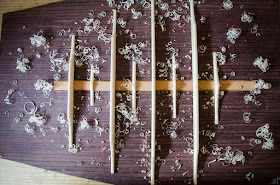 These will eventually be carved away entirely as the tips are formed, the working knocks cut about an inch farther down. On the third one I made, which was significantly heavier draw weight (upwards of 70#), I saved the knock on the top limb for use with a bow stringer. Back to tillering. With the backing, I am more confident bending it farther. As with before, I adjust the length of the string rather than the amount which it is pulled back. From the centre, I marked lines on both limbs at 1' intervals to measure how much they bend along the length. I do this because it will help find weaknesses of the limbs, as they might both bend to 27cm at a given time, but one might be at 11cm half way while the other could be 13cm. 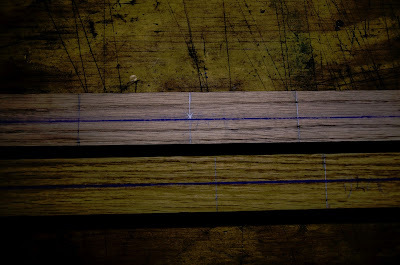 Squared and levelled, I gradually decreased the length of the string until it was a nice, gradual arc without any flat spots. At this time, I shortened the string so it would sit on the bow at about 3/4 brace and drew it back to 27 or so inches. After a few flexes and deflexes, I braced it to full and drew to the 30" I was going for. Didn't break. Before finishing it, I cut in the final knocks, bringing the tips to a point. It looks a little ugly here, as it is not sanded or stained, and the sheetrock tape shows a little. That was fixed later, as well as bringing the tips to a more rounded point rather than having those weird cantered flat spots. Stain. Three coats of a Danish oil that was lurking forgotten in a cabinet. To darken and preserve the backing, I also gave the front a light coat. Thus it is hung from the ceiling instead of resting on the workbench. Each one dried for around a quarter hour before putting on another, and when all three were there, I let it sit overnight. Making the handle was a little bit of a mental debate, but I ended up using leather with a leather thong to stitch it together. Nothing special here, although I modified it slightly the second time around. I only used every other hole because the thread was too short, and they were a bit too close together anyway. This is what the front of the bow looks like after the oil had time to dry and the handle shaped a little. Removing too much wood there would cause it to be a hinge, but it was too square to leave as is. A few passes with the plane to make it more D shaped, and the rest would be taken care of by the leather. This was pre-stain, and the handle is only as long as the original 6" markings. Finished handle, stitched loosely to be slid over the bow and tightened in place. Instead of trying off the ends with a knot, I fed them underneath the sides to create a slight bulge that can be used as an arrow rest. Being one for traditional archery, I do not like having them cut into the bow itself, but rather use my knuckle or torsion from my fingers on the string. And here is the finished bow. It is still 6' long, about 2" less knock to knock. At 30" it draws ~33lbs, although that was measured by hanging dumbbells from the string with a hook. I've only shot it with the yellow braided string I used in tillering, but it shoots fast and fairly smoothly. 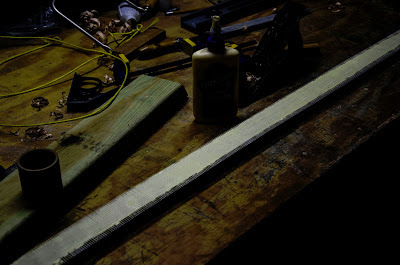 There is more spring and power behind it than the other 30# red oak bow I have that I did not make, although near the end of the release it slows down just a hair more. All in all, it was a great experience, and will certainly not be the last. Awesome informational work. 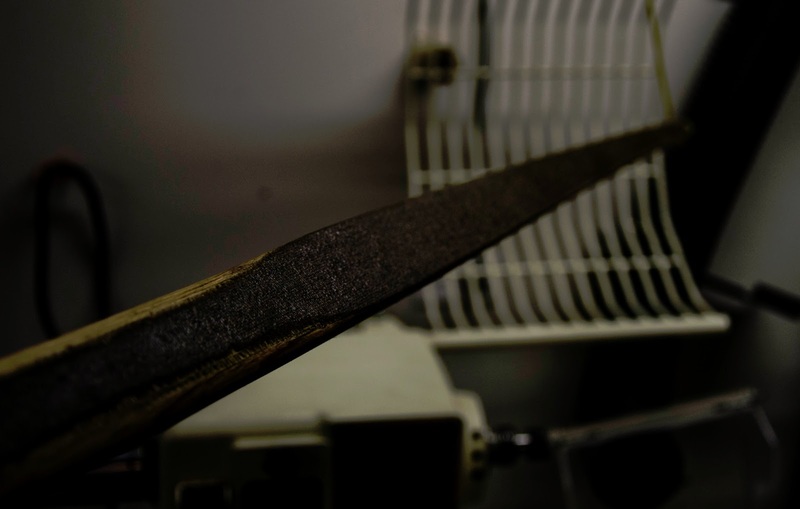 I've been wanting to attempt a bow myself for quite a while, but have been either too preoccupied with work, school, or a bladesmithing project to do so. This may be the motivation I need! I would be happy to! For other readers, I'll post it here, too. I watched your video, it was amazing. Great job well done! I based my first attempt on this bow and got it around 85% RIGHT but somehow buggered it up in the tillering I have one perfect side and the other, well, its not good lol, I get mixed messages about the preferred dimensions of a longbow, is there anywhere on this page that shows that as mine i suspect was too thin and too late for backing? I'm sorry to hear that it failed in the last stages. English longbows have, if I failed to mention it elsewhere, their limbs with a cross section in a D shape as opposed to a rectangle or >. As a general rule, you will get much more power out of the thickness than the width of the limb. 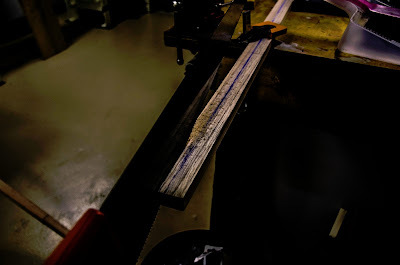 Traditionally English longbows have their thickness at least 5/8 of their width. Other styles of longbows can range between 1/3 and 3/4 thickness of their width. Also, longbows are well, long. Usually between 6 and 7 feet nock to nock. Unfortunately I am not the best source for more info on traditional dimensions, but the forums at PaleoPlanet and TradGang are both excellent sources and can probably answer any questions you might have more accurately than I can. Hope you stick with it and start another! Thanks for the wonderful description. I watched your video, but you don't describe the steps or measurements there, so this helped. I have mad a bow out of a red oak board and I learned a lot. Mine was a pyramid style according to directions fro Milton Cable. I will have to try a longbow now. A good educational video, lovely to see a bow made using traditional methods rather than conduit and heat. Well done !